On Sunday, Aaron and I went to brunch at Madison Sourdough, a local bread company. I had an egg, ham, and cheddar sandwich on a croissant. Didn’t even manage to take a picture because I was too busy chowing down! We also picked up a new puzzle (which has already taken up residence on our kitchen table) and watched the Packers playoff game, before I headed off to teach my Sunday afternoon Piloxing class. The class goes from 5-6, which is kind of an inconvenient time for getting anything ready for dinner afterwards. Instead of romping through the kitchen to find food, we decided to order a pizza (+ served with a salad on the side!). 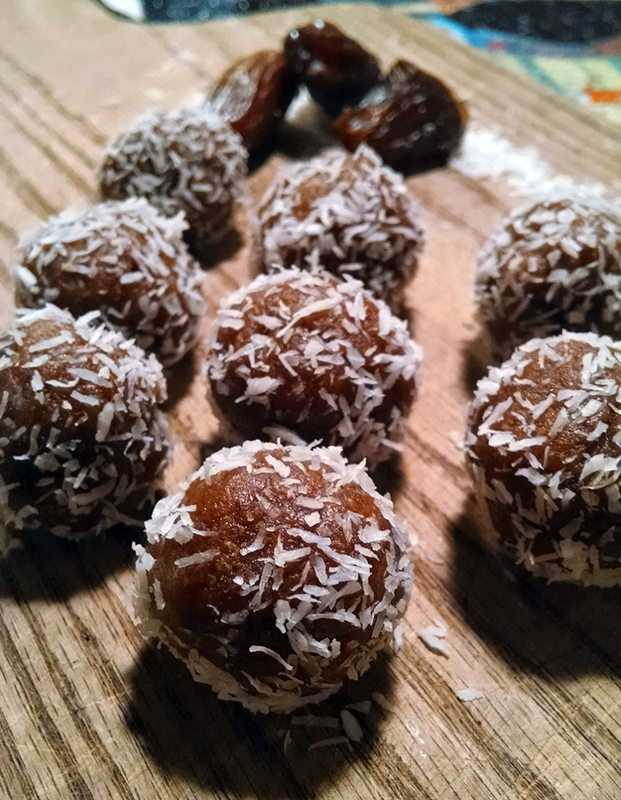 This weekend I also perfected my recipe for these delicious date and coconut bites! They were the perfect after-workout snack while we waited for our pizza to arrive. 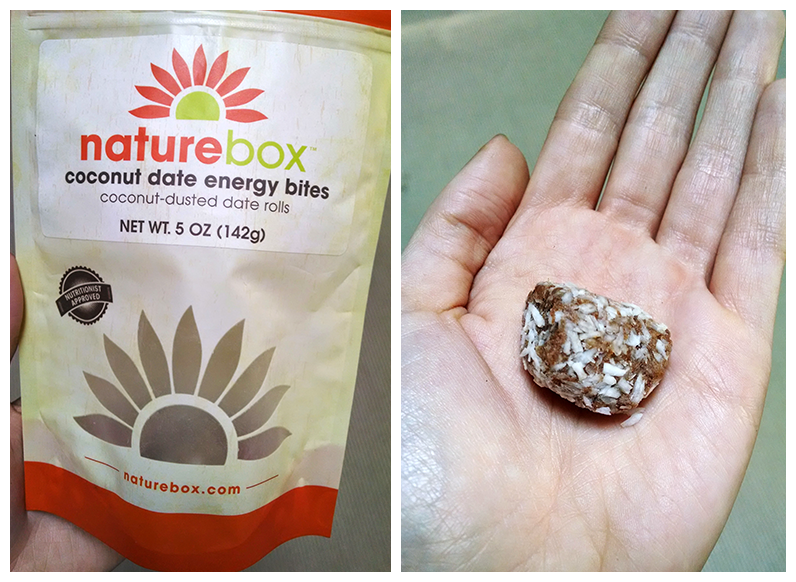 Are you familiar with NatureBox? It’s a subscription service that sends a monthly box of tasty, healthy snacks. I’ve been receiving boxes regularly for a few months now and am signed up for the 5-snacks-per-month option. The great thing is that you can either customize your snacks or choose to have NatureBox select them for you. 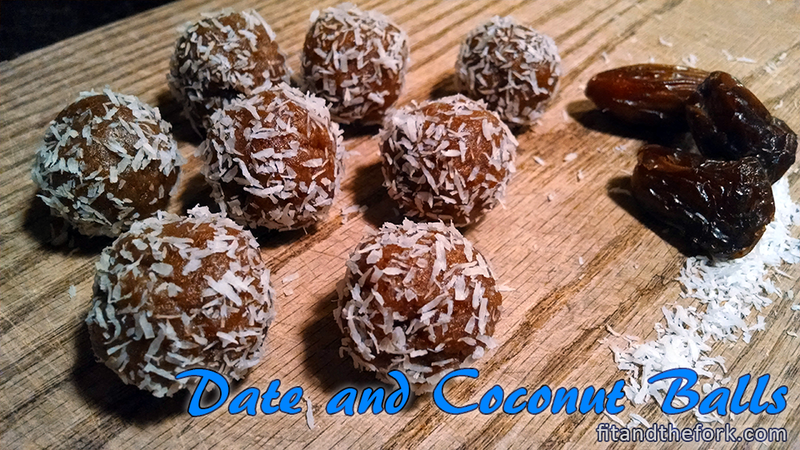 I typically choose my own, and when I saw these coconut date energy bites, I couldn’t wait to try them! Needless to say, they’re delicious. And they disappeared within days. Since I knew I couldn’t wait another month to get more, I decided to create my own homemade version. 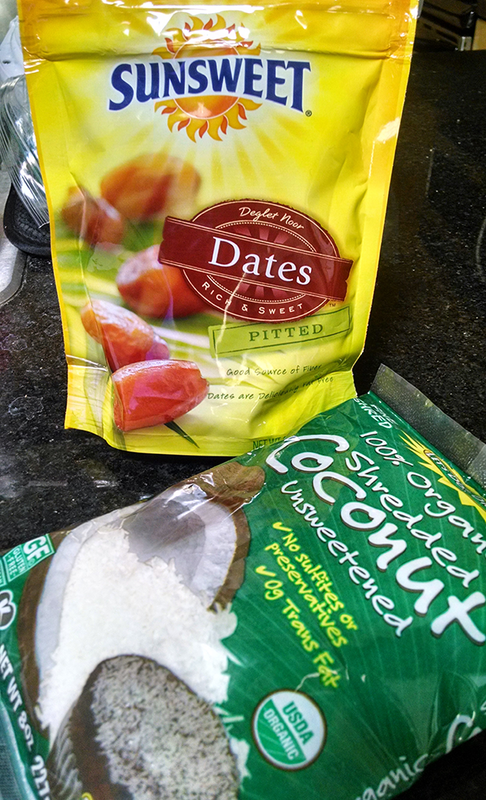 All you’ll need to make these are pitted dates and unsweetened, shredded coconut. 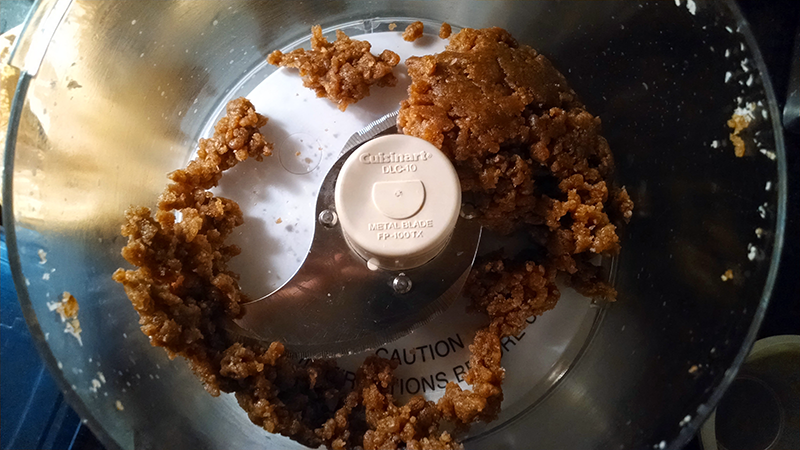 You’ll add everything to a food processor (bananas in the background not included ;) ). 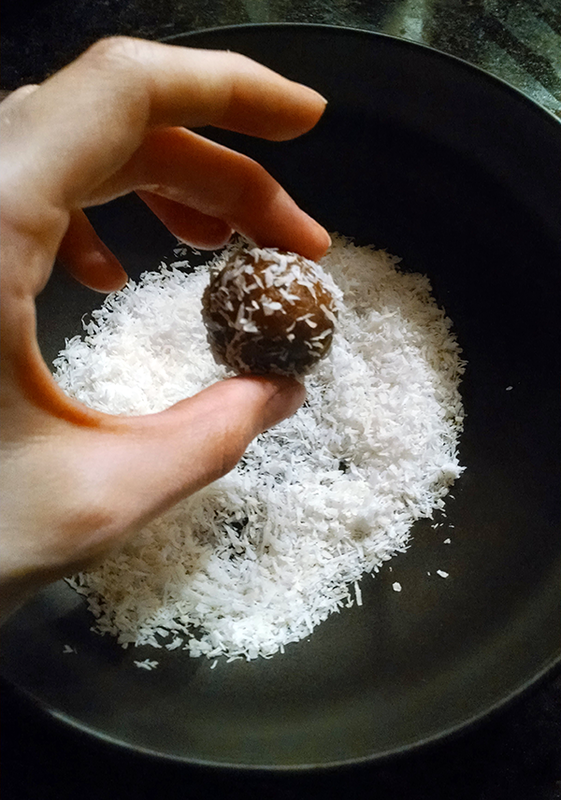 Form the “dough” into bite-sized balls, and roll in extra shredded coconut for a fancy touch. Snacks are served! These are so crazy easy to make and taste incredible. Loaded with fiber and healthy fats, they’re great for a mid-afternoon or post-workout snack. 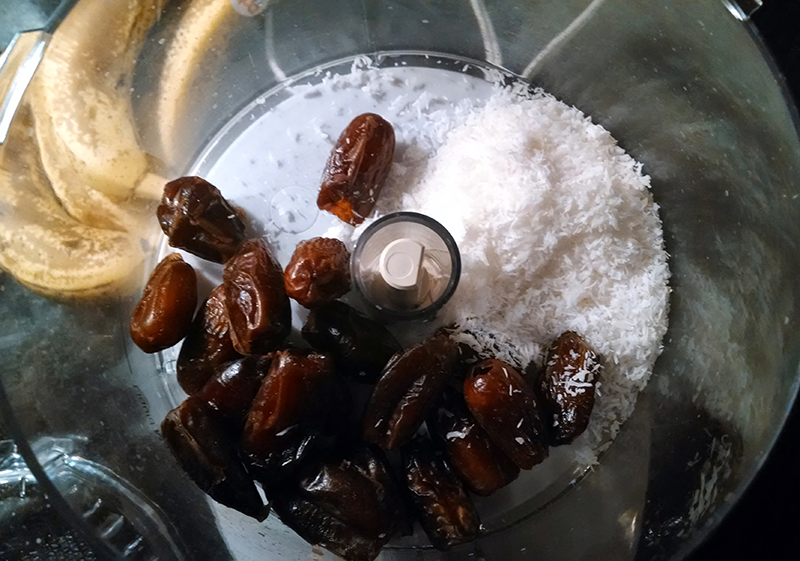 The sweetness of the dates make them almost like candy, so I’ve even been eating them as an alternative dessert option! Give these a try, I hope you love them as much as I do!